Originally considered a variant of the Rat Terrier, the American Hairless Terrier was deemed its own separate breed on January 1, 2004 by the United Kennel Club. The American Hairless Terrier (AHT) is identical in build to the medium-sized Rat Terriers with its deep chest, strong shoulders, solid neck and powerful legs. It carries its ears erect when alert much like the Rat Terrier, giving it a bat-like appearance. 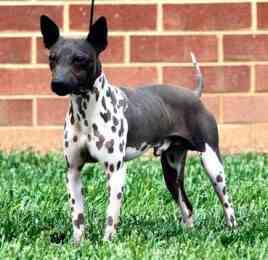 This well-muscled dog is often mistaken as a Chihuahua but the AHT truly descends from the Rat Terrier.